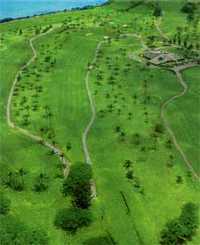 The 9-hole Ke'alohi Par-3 Golf Course in Hickam AFB, HI is a military golf course that opened in 1965. Ke'alohi Par-3 Golf Course measures 1435 yards from the longest tees and has a slope rating of 113 and a 35.5 USGA rating. Great for a beginner or quick run through. Front desk assistant (Maria) was very helpful! Discount fee since the course had been aericated recently. This course is awesome for beginners or for a quick round of golf. the manage is extremely professional. however, the "starter" (asian guy) that works in the evenings is not professional and is rude. i had to file a formal complaint about him. i have a feeling i wasnt the first.